Thanks to www.stpetersbasilica.info for this article. 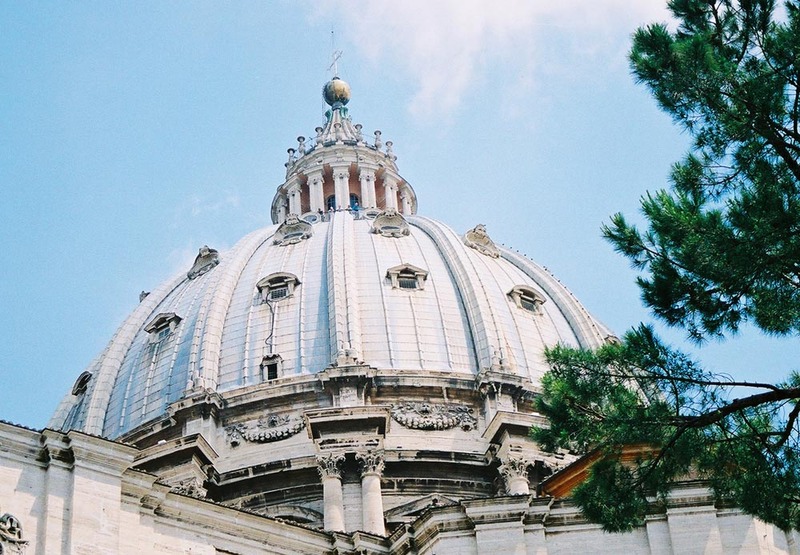 Michelangelo's famous dome is accessed from an elevator to the roof (€10), a walk inside the drum (great view into the basilica), and then 320 steps inside the Cupola to the best view of Rome. Apr-Sep 8:00-17:45, Oct-Mar 8:00-16:45. The Colonnades consist of 284 Doric columns and 88 pilasters of travertine marble. These columns, 13m. tall, are arranged in four rows. With the trabeation surmounted by a balustrade, the overall height is 21m. 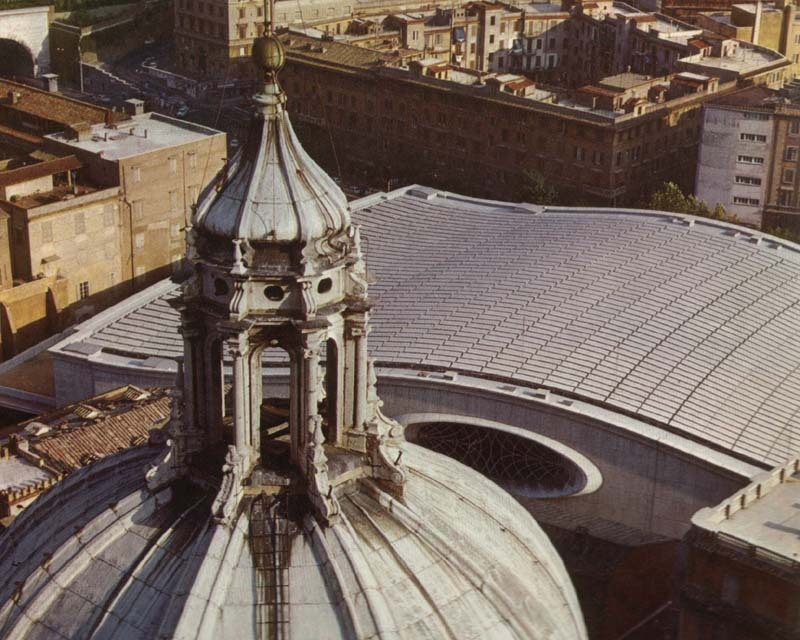 Bernini built two straight covered wings (Charlemagne left, Constantine right) 120 m. long, to link with the basilica's façade. The obelisk (25.31m) from Egypt, was brought to Rome in 37 BC by Emperor Caligula for his Circus. It became the witness of martyrdom of St. Peter and other Christians. Sixtus V had Fontana move it to its current position in 1586.
name the wind that comes from each direction. Between the obelisk and each fountain are white marble and granite discs, which mark the centers of each colonnade. Standing on the disc, you will see only the fist row of columns. 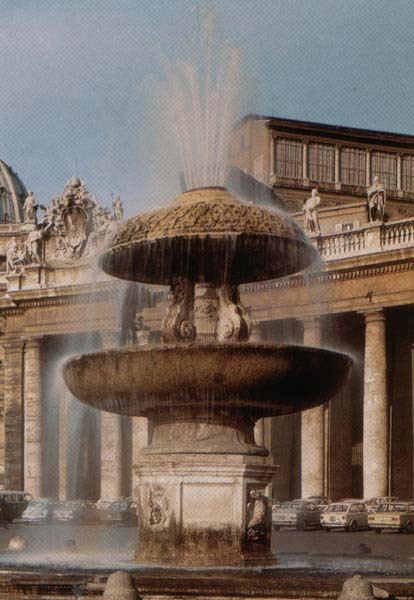 The fountain (8m) on the north is the work of Carlo Maderno (1613). Bernini, who designed the square, had it erected where it now stands, and for purposes of symmetry built the fountain on the south (1675). From the obelisk past the fountain on the north, are white marble discs used as sundial markers for the obelisk. 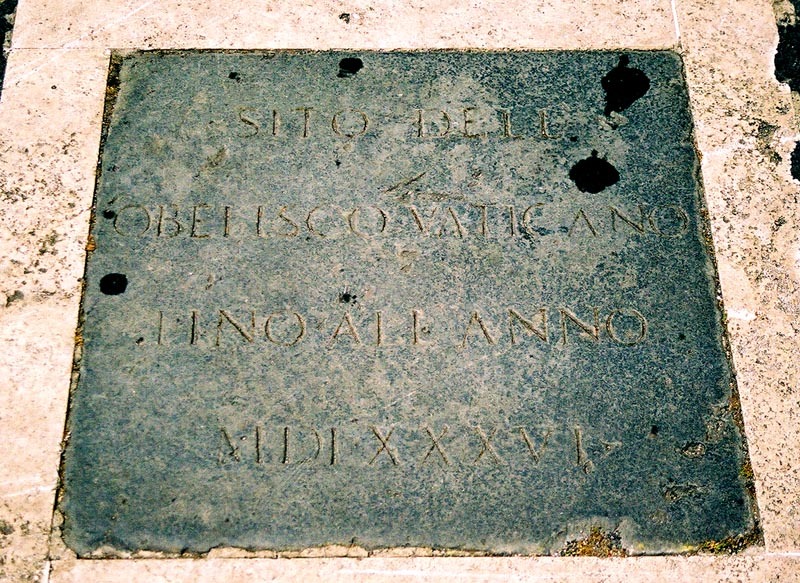 Two dates are inscribed on each disc to indicate when the noon shadow of the obelisk will reach this spot. 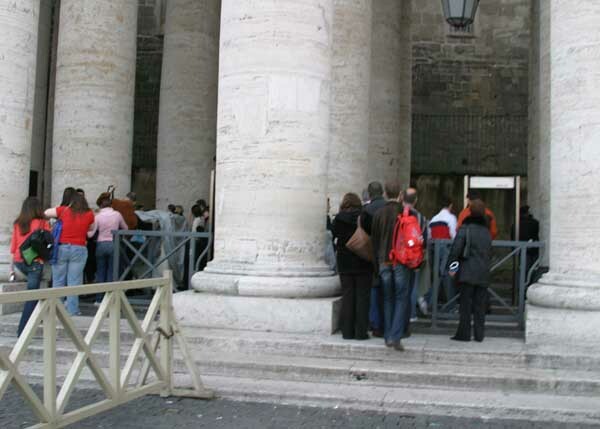 The security queue to enter St Peter's will often reach the opening at the front of the Square. Depending on how many scanners are open and how fast people empty their pockets, it could take 30 to 45 minutes from here. When the line circles the entire colonnades, wait times can be a hour. 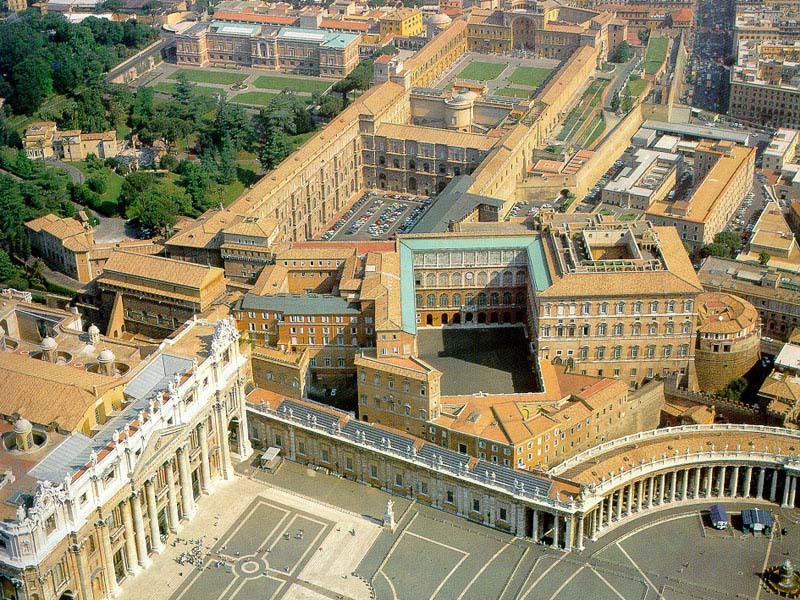 The Apostolic Palace is actually a group of buildings which include the old Papal residence. 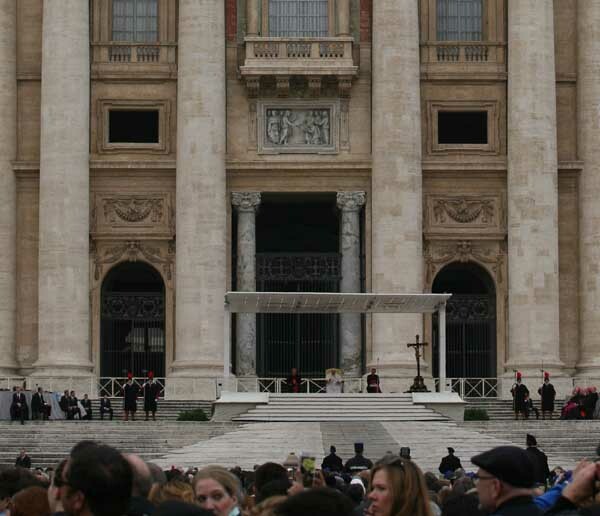 The Holy Father appears at noon on Sunday (second window top right) to pray the Angelus with the crowd in the Square. 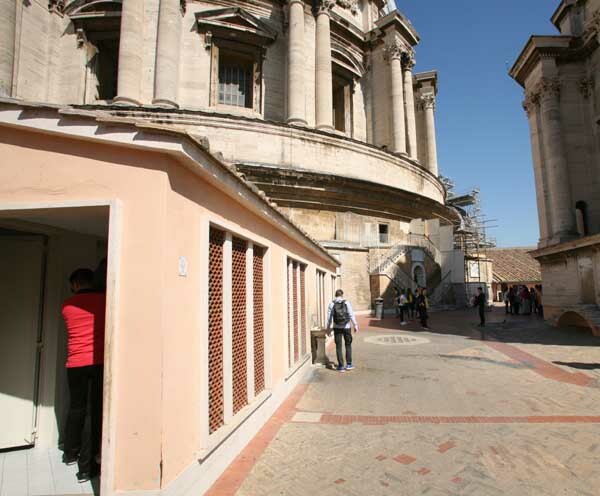 There are three main restroom areas: along the Charlemagne Wing (left side), beyond the colonnades on the upper right side, and in the baggage check area on the right side of the facade of the basilica. 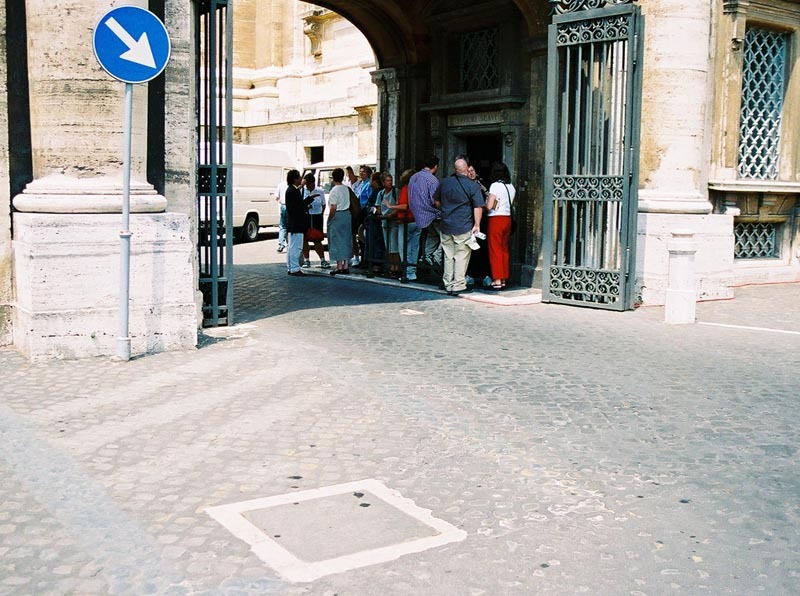 The queue to enter the basilica must pass through here. Security scans all baggage, and the signs tell you; no shorts, bare shoulders, pets, knives or scissors. At times the line can curve around the Square and be over an hour long. 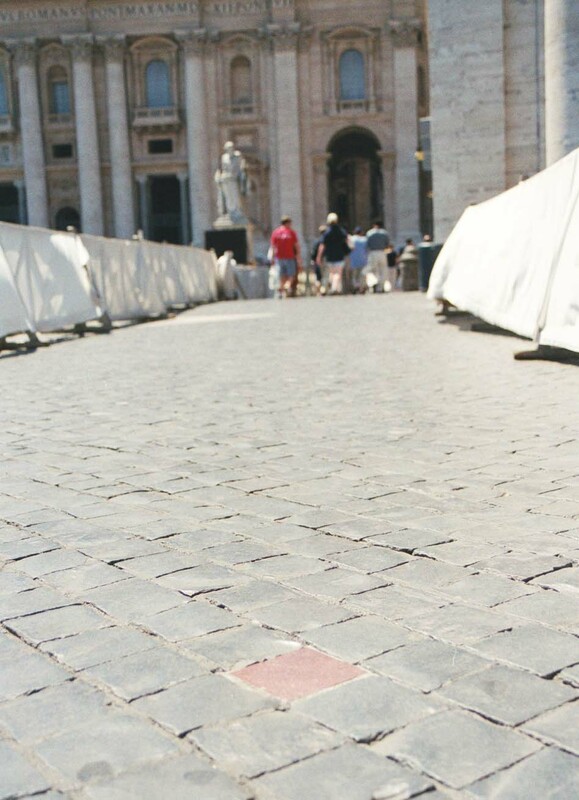 A white marble inscription, marks the spot where Pope John Paul II was shot on May 13, 1981. Just beyond the colonnade on the right, is the Bronze Doors used as an entrance to the Apostolic Palace. 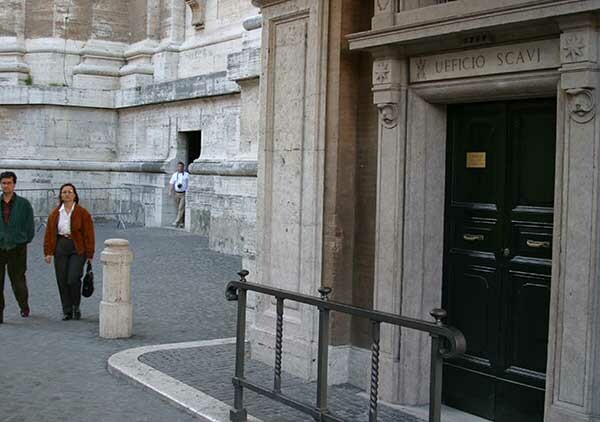 Swiss Guards stand at this door, but they may be approached to obtain tickets to the Wednesday Papal Audience. 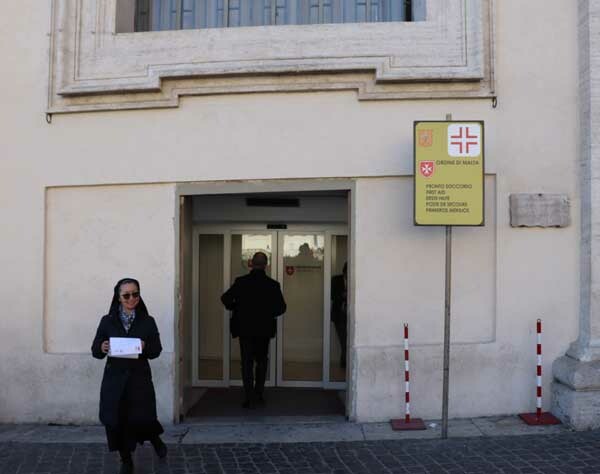 This large Sign as you walk toward the entrance to St Peter's covers all the basic information. 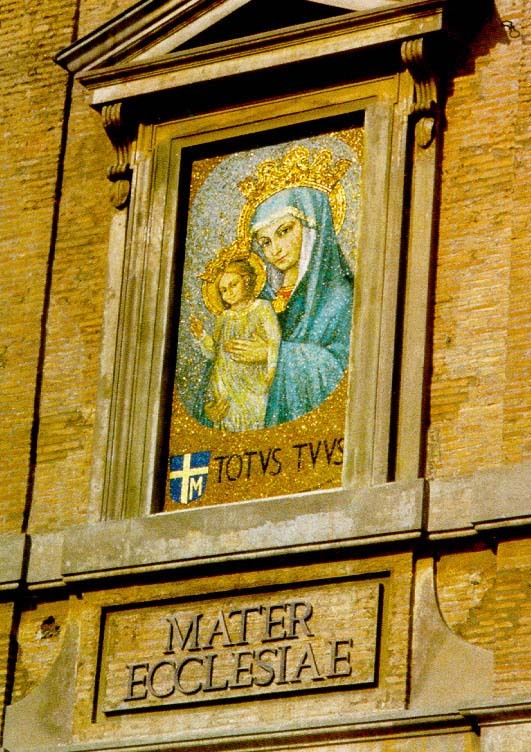 On December 8th, 1981, John Paul II, before the recitation of the Angelus, blessed this new mosaic image of Mary, Mother of the Church. He had survived an assassination attempt six months earlier and felt that the Virgin Mary saved his life. This statue was sculpted in 1838 by Adamo Tadolini, a student of Canova. St. Paul has a long sword in his right hand, while his left hand holds a book. On the book is the inscription in Hebrew letters: "I can do all things in him who strengthens me", from Phil 4:13. 7 Stations of the Cross in bronze run along the wall of the Constantine Wing as you walk toward St Peter's. The other 7 Stations in stone are on the opposite side, the Charlemagne Wing. 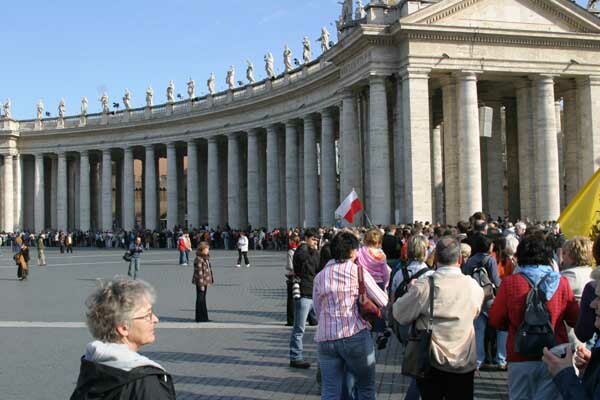 Checking your backpack is mandatory and free at this location to the right of the basilica. 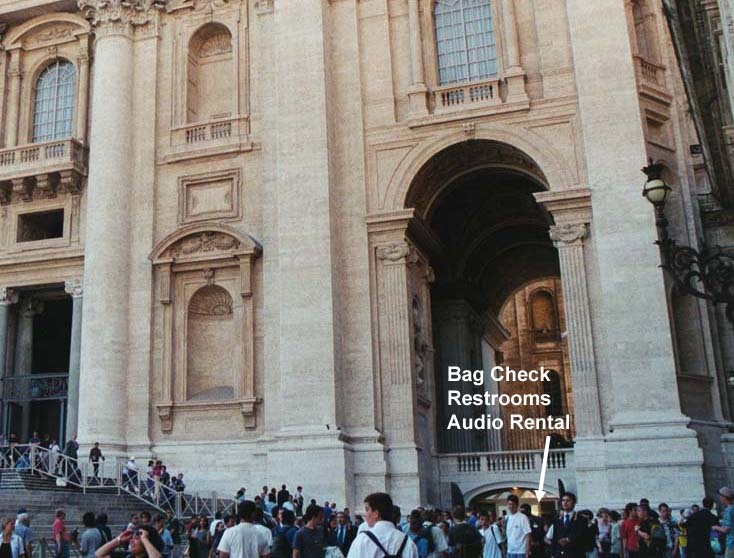 It also has the newest restrooms, and now you can rent an audio tour of the basilica. The Facade of St Peter's has many interesting features including: The Window of Blessings, The Statues and Clocks on top, and the Consignment of the Keys sculpture. 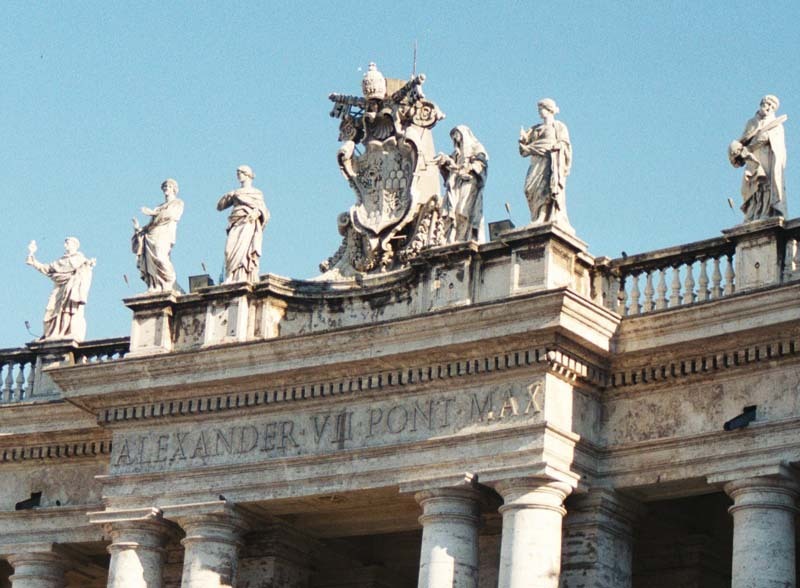 These 13 large statues on the Facade of St Peter's are of Christ, John the Baptist and 11 Apostles. St Peter's statue is not here, but down in the Square. 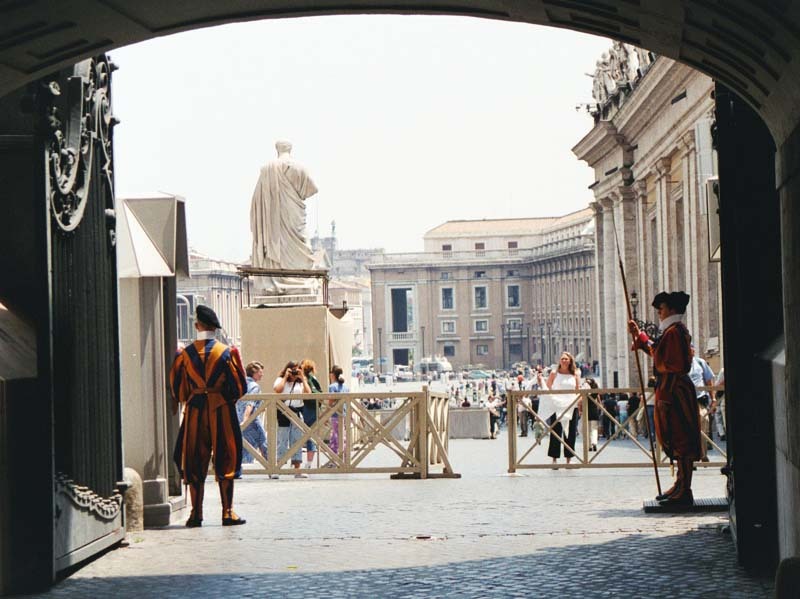 On the North end of the Portico is Bernini's statue(1670) of Constantine receiving a vision before his battle for Rome. 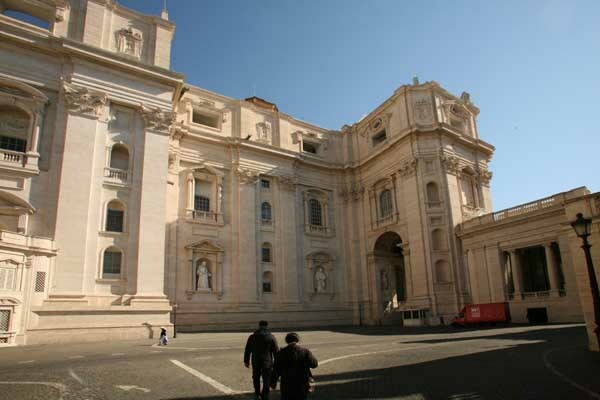 Since it is on the Scala Regia leading to the Apostolic Palace, it can usually only be seen through glass doors. 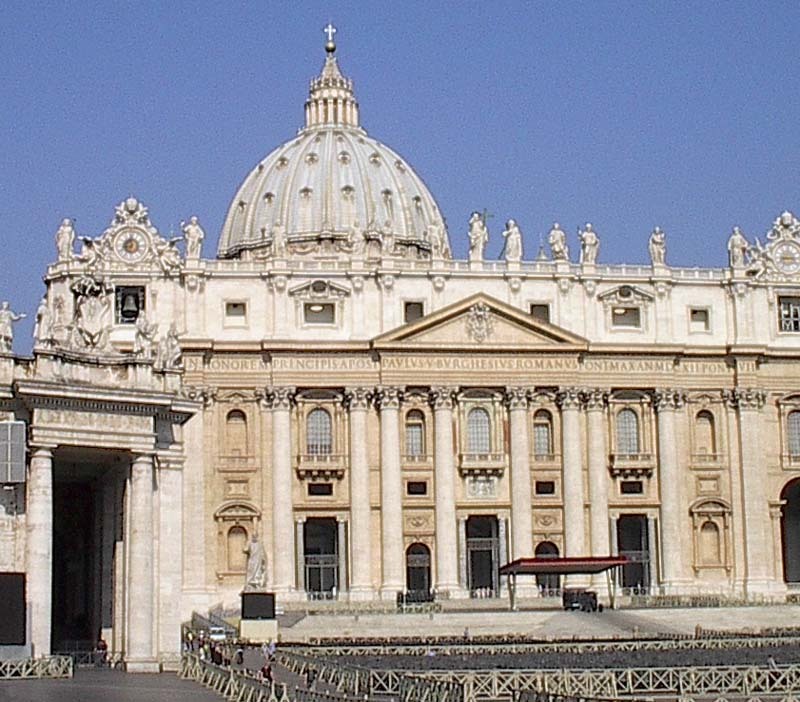 The roof of the Sistine is visible from St. Peter's Square. 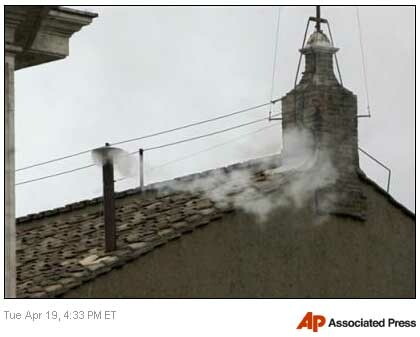 It's from here that the famous white smoke announcing a new pope is seen. 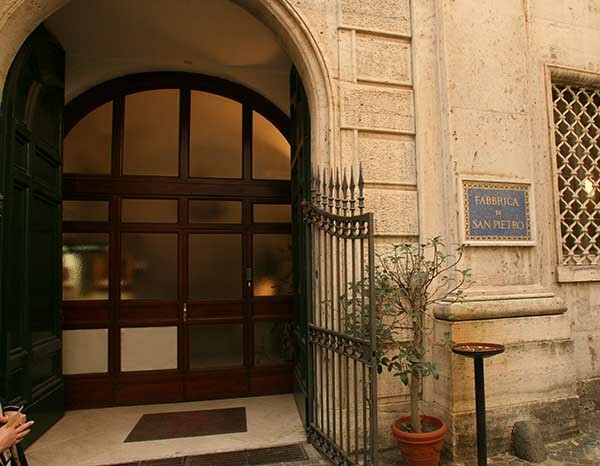 Access to the Vatican Museums and Sistine Chapel is a 15 min. walk (north) around the Vatican walls. 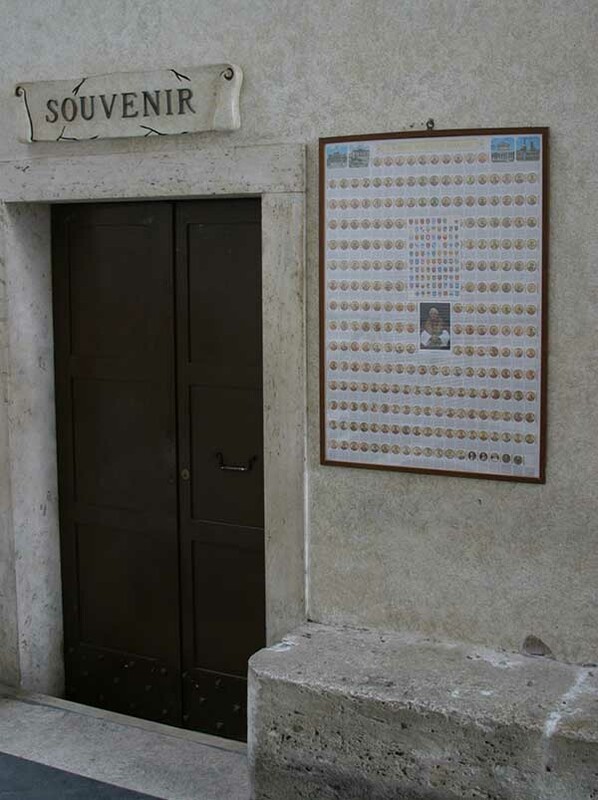 As you enter the patio on the North side of the Portico there is a small souvenir shop. This is one of several at St Peter's, the others being at: South Wing of Colonnades near the basilica exit, Treasury Museum entrance, and on the roof. 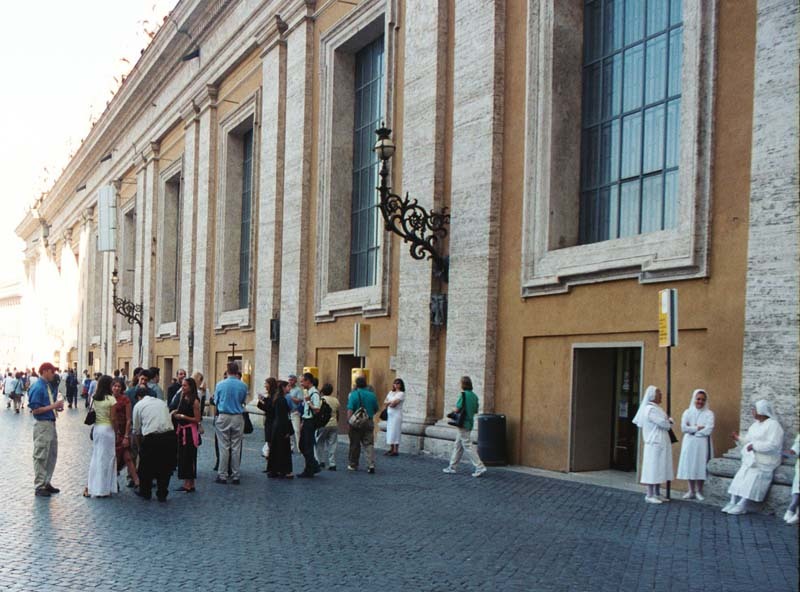 This area called the Cortile, or St Gregory the Illuminator Patio, contains the Cupola Kiosk, Exit stairs from the Sistine Chapel, Exit from the Grottoes, a Fountain and a large statue of St Gregory. 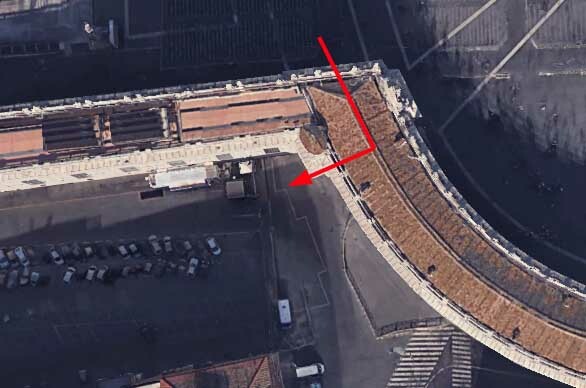 This is the entrance point onto the roof of St Peter's from the elevator or stairs. It's definitely worth the two extra Euros to use the elevator. Before walking over to the entrance of the Cupola, you can take a look over the edge of the basilica down at the Sistine Chapel. 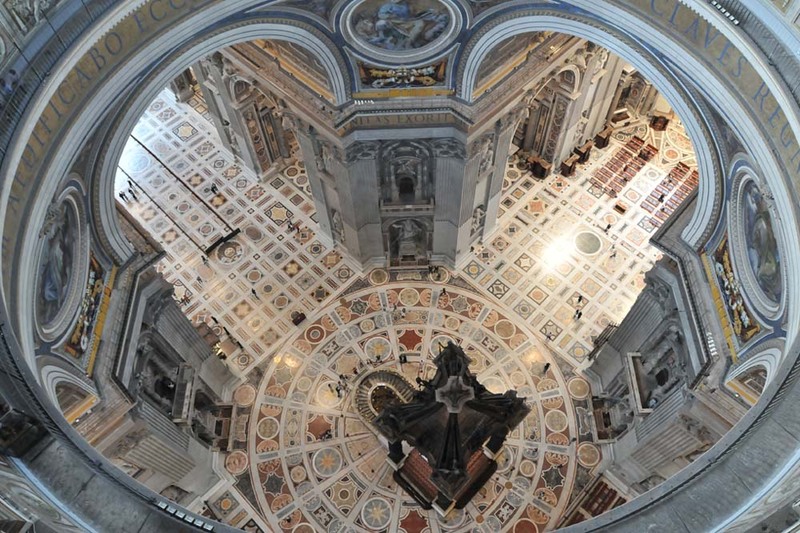 As you enter inside the Cupola, there is a stunning view down into the basilica. Walking along the railing, you can see up close the large mosaics on the wall. 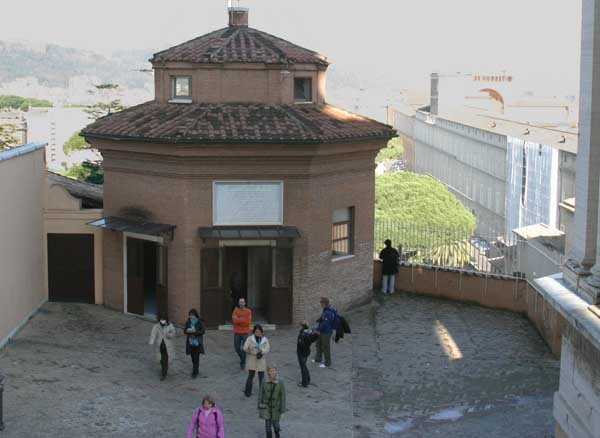 From here you can choose to climb the 320 steps to the top of the Cupola, or just exit to the roof level. Exiting from the Cupola, you'll find a convenient WC and water fountain. Take a moment to notice the bust of Michelangelo at the bottom of the steps. The roof provides some views of the Vatican and Rome, and you'll also find a nice gift shop, and a Refreshment bar. Take the elevator or stairs down to the Basilica level and arrive at the Stuart Monument. 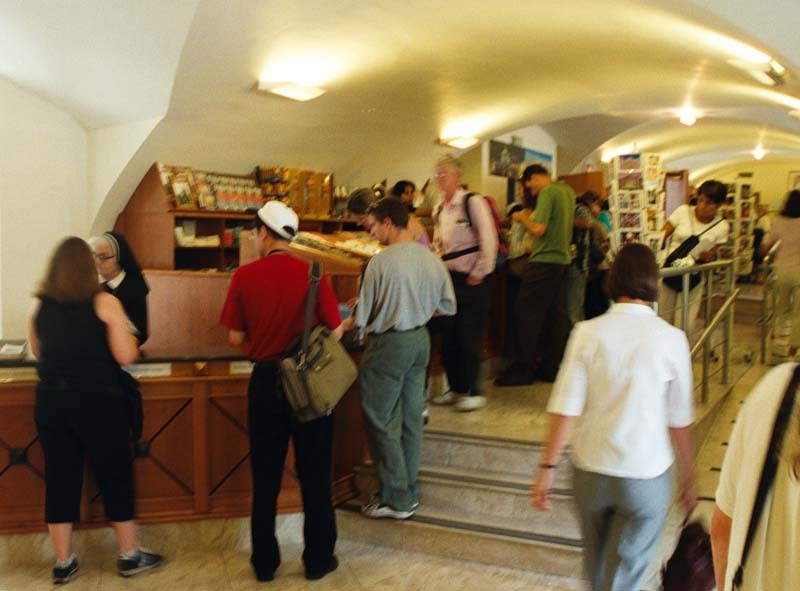 If you like the unusual, the stairs provide some odd historical inscriptions of people who have visited the Cupola, and the tomb of Maria Clementina Sobieski. 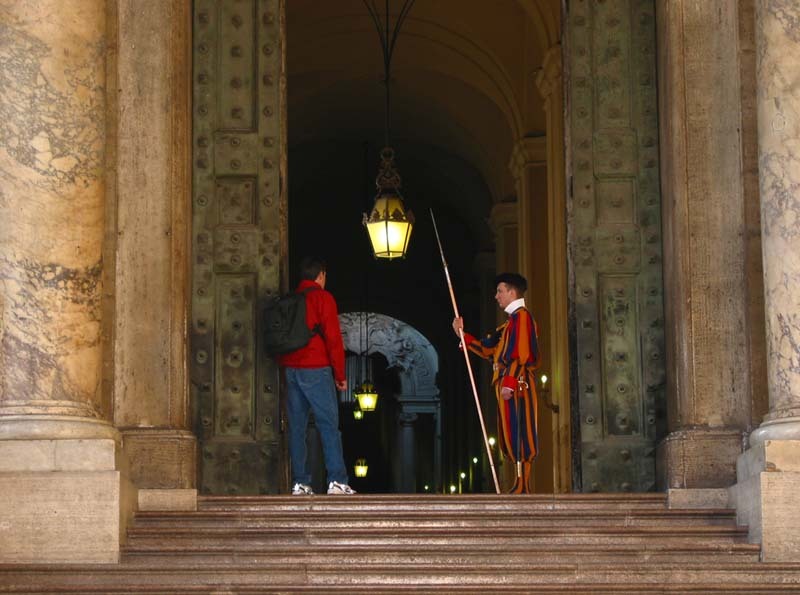 Swiss Guards at this entrance to the Vatican will not let you pass, but gladly allow photos. 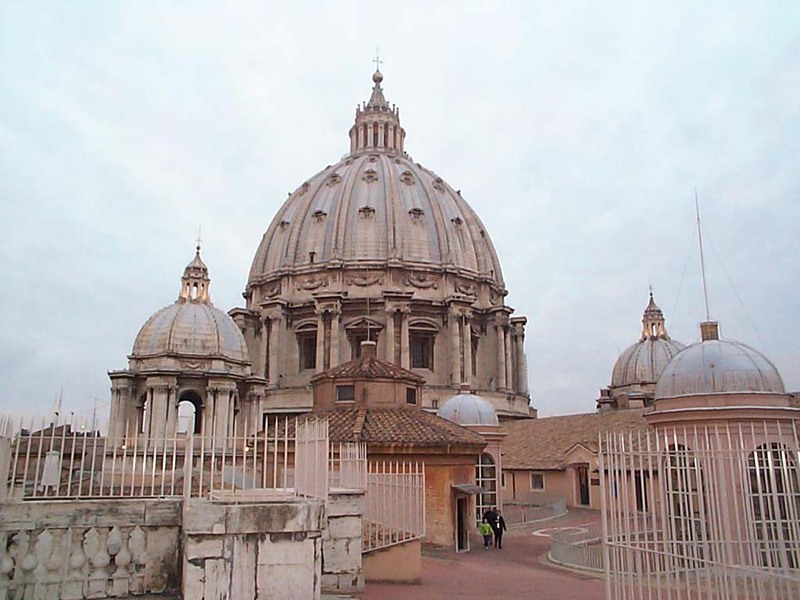 Above this arch are the bells of St. Peter's, the largest with a diameter of 2.5m. 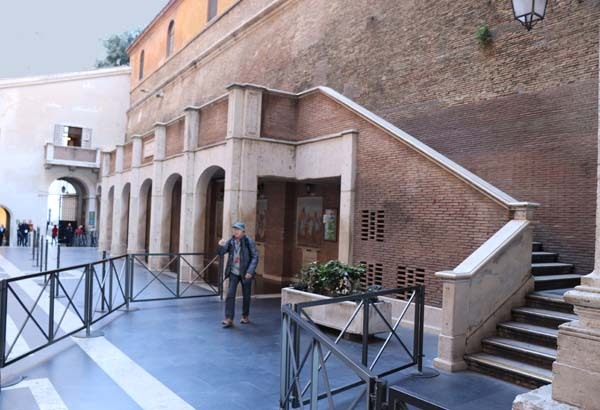 At the bottom of the steps is the no-return exit to the basilica. 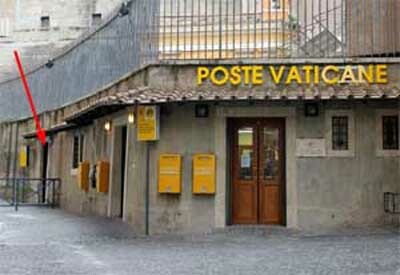 The John Paul II Book Store is the only book store in this area of the Vatican. They offer a wide variety of books in multiple languages. A good place to send a post card home, browse for souvenirs, or ask questions at the information window. Closed Sunday. When the seminarians are in school, they provide free tours in English, Mon - Fri at 2:15 PM. 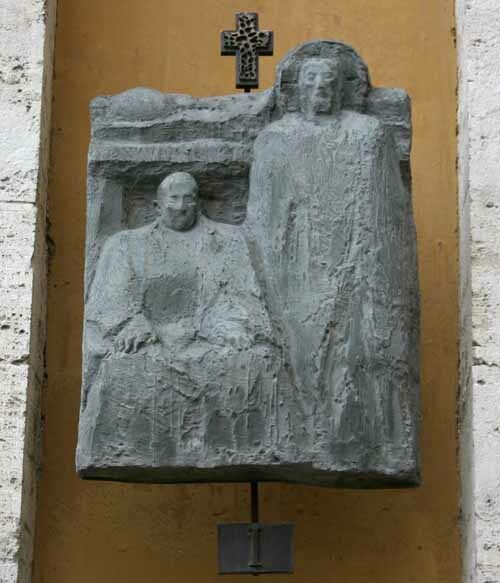 Pius IX (1846-1878) decided to replace older statues of Sts. Peter and Paul, with the current larger ones on Easter 1947. The previous pope, Gregory XVI (1831-1846) had commissioned Giuseppe De Fabris to sculpt this statue for St. Paul Outside-the-Walls from 1838-1840. Along this section of the Charlemagne Wing is a First Aid Station. There restrooms along the Charlemagne Wing can get very busy at times, with longer wait times on the women's side. 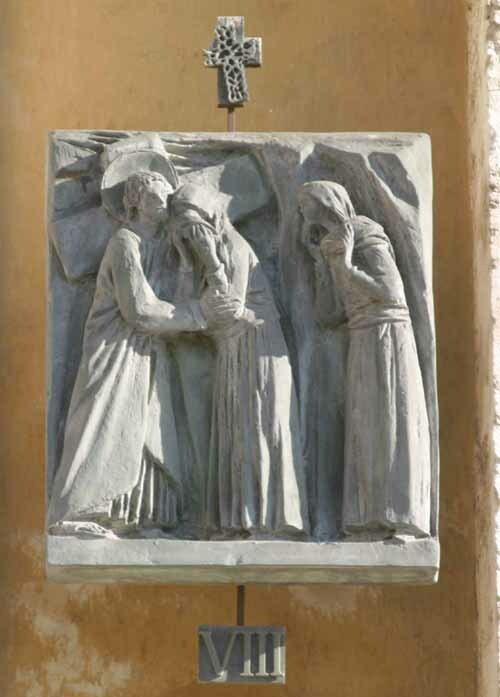 7 Stations of the Cross in stone run along the wall of the Charlemagne Wing as you walk away from the basilica. The first 7 Stations are in bronze on the opposite side, the Constantine Wing. This is an entrance into an exhibition hall inside the Charlemagne Wing. Check for signs to see if there is a current exhibition. 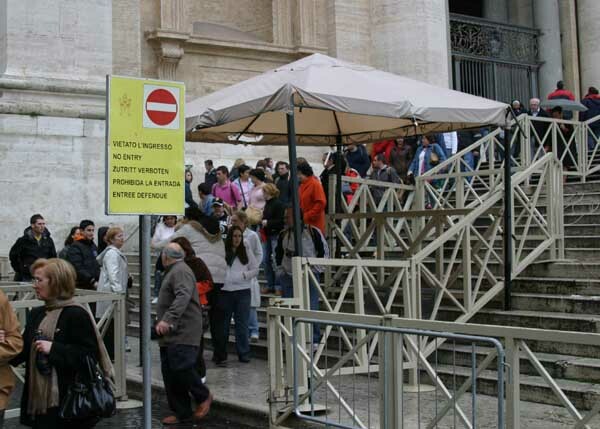 Those with reservations for the Scavi Tour to the Tomb of St Peter, must pass through security at this point. Have your reservation information in hand, and arrive 10 minutes before your tour. The Piazza along the South side of the basilica is so called, because the first Roman martyrs were killed here in the Circus of Nero in 64 AD. 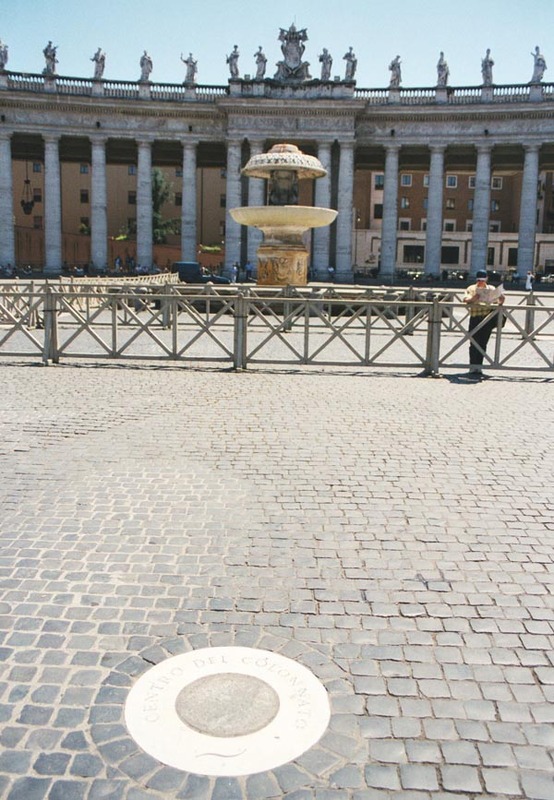 If you're fortunate enough to book the Scavi tour under St. Peter's, you'll see this spot where the obelisk stood from the time of Caligula until Fontana moved it to the square in 1586. After gathering with your tour guide, you enter the Grottoes through this door. This area is entered from inside the basilica. Pius VI had it built in 1776. Priests vest here before their mass. The Museum contains historical items of the basilica. Open Apr.-Sept. daily 9:00-18:30; Oct.-Mar. 9:00-17:15. 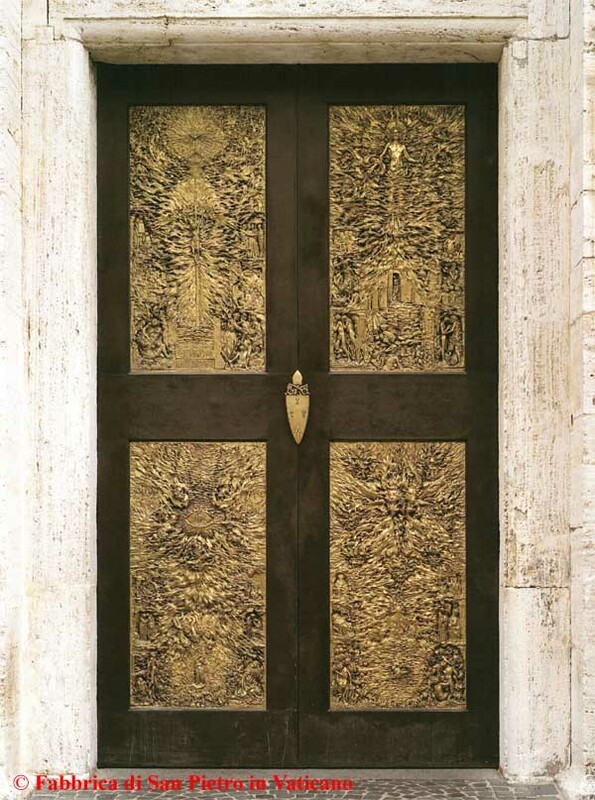 The Door of Prayer (1972) is not available to visit. 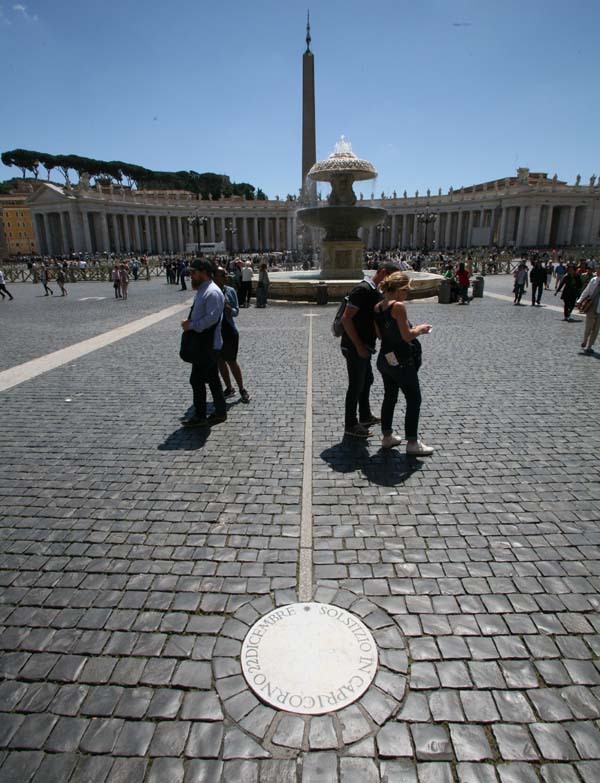 It is accessed from under the Alexander VII Monument in the basilica and leads to the Piazza Santa Marta in the Vatican. The artists who work in the Mosaic Studio restore the mosaics in the basilica, create mosaics that the Pope gives to heads of state, and produces pieces by commission. Tours are available from Vox Mundi. If the weather is bad, the Wednesday Papal Audience is held in the Paul VI Hall. 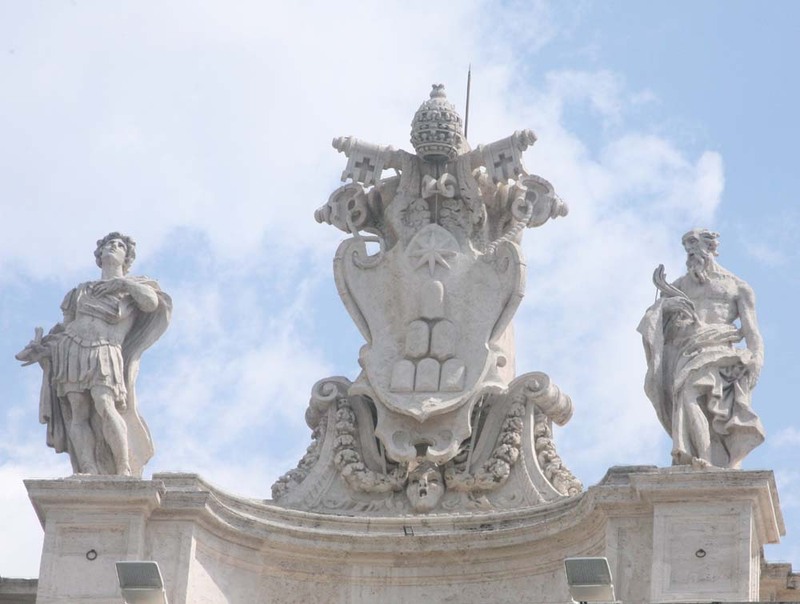 Back in the Square, on both sides of the Colonnades, there are Coats of Arms of Alexander VII (1655-1667), who commissioned Bernini create the Piazza San Pietro. Just outside the colonnade, against the passetto wall, is the fountain of the four tiaras. Or you could just use one of the four fountains around the obelisk. Six papal coat of arms of Alexander VI (1655-1667) are located around the square. It was Alexander who decided to build the square as we know it today. 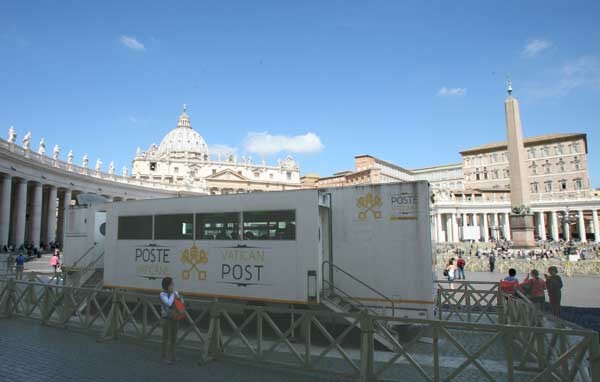 This mobile Post Office is one of three in the Square. The others are on the South (Left) wing of the Colonnade Wing near the Information Desk, and beyond the the North (Right) Colonnade. 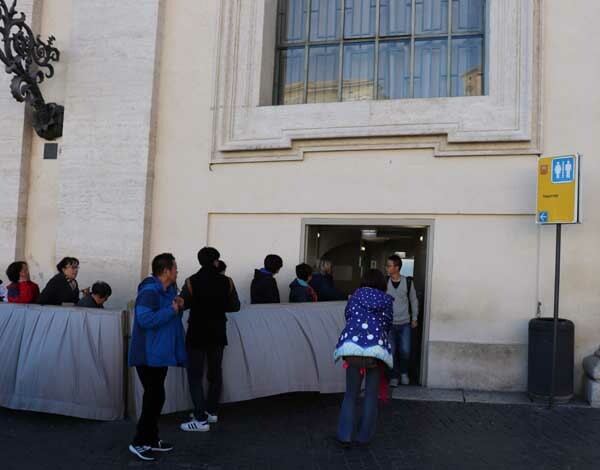 This covered passageway (apx 800m) between the Vatican and Castel Sant Angelo was an escape route for Pope Clement VII during the sack of Rome in May 1527. Outside the Colonnade and against the Passetto is the Fountain of Four Tiaras. 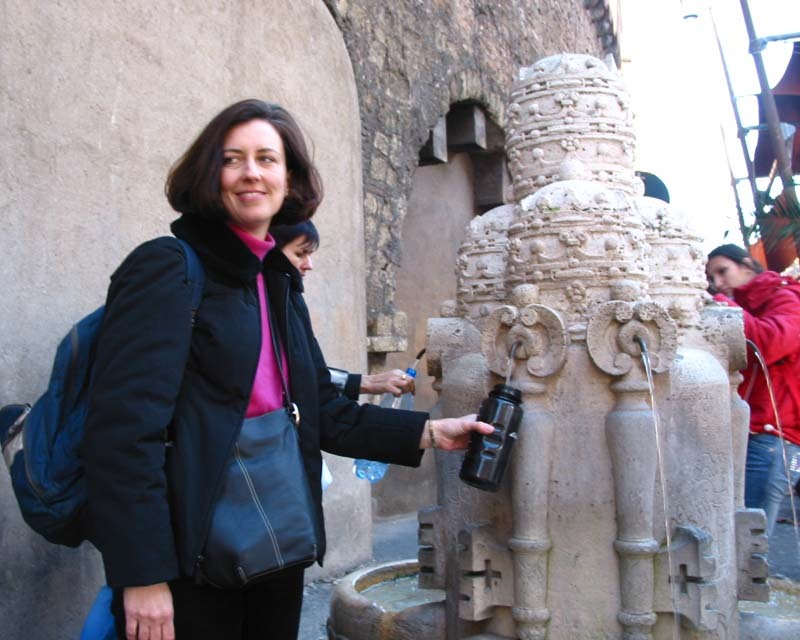 A good place to fill a water bottle, or you could use the other fountains around the obelisk. 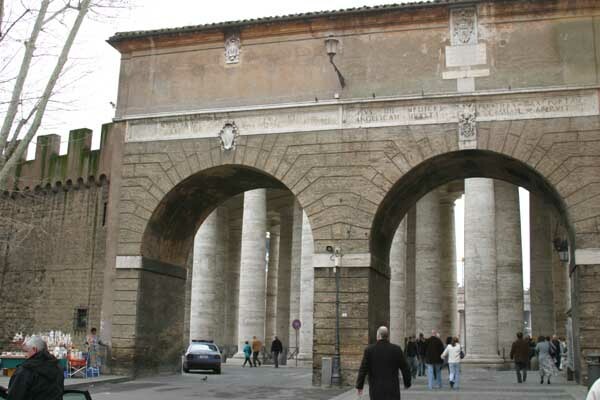 The Porta Angelica is an opening in the Passetto wall to the street of Via Porta Angelica. This street leads along the Vatican walls to the Vatican Museum entrance.